ERNEST KAAI LEFT ON HIS MUSICAL TOUR OF KAUAI. Last evening, Professor Ernest Kaai of the town of Honolulu nei left for the island of Kauai along with his fellow musicians to hold concerts in the places where they will visit, and they will not be left without being welcomed by the people of Kauai. Travelling along with him are Mrs. Nane [Nani] Alapai, the singer of the Royal Hawaiian Band; Miss Keala; Mr. Holokahiki; and John Noble, Jr., a youth skilled on the flute [hoopiopio?]. They number five in total, and they are members of that band that is moving quickly through the places they visit. After arriving on Kauai, Lihue is the first port where they stop, and it is there that they will hold their first concert tomorrow. After that, their tour will go all the way to Koloa where they will have a concert on the coming Monday, the 6th. Then their musical tour will move on to Eleele, where they will have a musical assembly on the next Tuesday, the 7th. From there they will arrive at Waimea, and they will open another concert on Tuesday [Wednesday] the 8th. And then onto Makaweli where they will have another concert on the next day, the 9th. Ernest Kaai and his band mates will spend a number of days on Kauai, and when they reach Makaweli, and hold a concert there on the day shown, it is then that they will know where their tour will move to next. On this tour, Professor Kaai has time to give benefit concerts for good causes if it will be beneficial, but this all depends on the scheduling. Mr. Kaai is a young Hawaiian that is well known in this town among the Hawaiians and among the haole that love playing music, for the regular job of that young man is teaching music. There are many haole women and haole men and Hawaiians as well who were taught by him and graduated in music. Ka Nupepa Kuokoa, Buke XLV, Helu 31, Aoao 8. Augate 3, 1906. 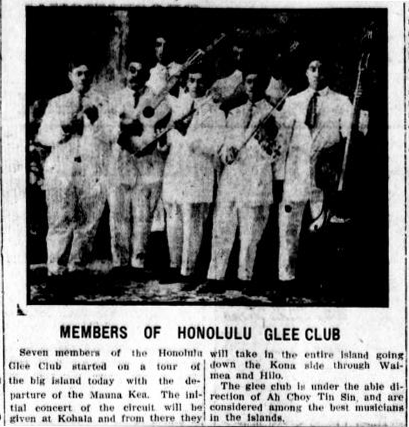 THE SINGING GROUP, “HONOLULU GLEE CLUB” OF THE HAWAIIAN BOYS. Led by Ah Choy Tim Sin. Front row—R. K. Kumulala [Kumululu? Kumuliilii? ], D. W. Waipa, Ah Choy Tim Sin, R. M. Kamaunu, F. W. Keao. Back row—S. Kanekoa, J. Kahikina. This Singing Group will arrive in the districts of North Kohala, South Kohala, Hamakua, Hilo, and Puna, should they not meet with any troubles on their road. This group is under the direction of Ah Choy, a skilled youth [line hidden by fold]. [Line hidden by fold?] with the melodic flute, and included in this group is the skilled hands of Mr. Waipa, the prince of Kona and Kohala. Please fill their singing audience; they will arrive in North Kohala on August 5, 1911. Kuokoa Home Rula, Buke IX, Helu 30, Aoao 1. Iulai 28, 1911. Evening Bulletin, Number 4993, Page 8. August 1, 1911. George E. Gall to Helen Bruns, Feb. 19. Edwin Ernest Brandt to Annie Kane, Feb. 23. William Kahoii to Rose Castino, Feb. 23. L. K. Aiu to Henrietta Apa, Feb. 24. August Reimann, Jr. to Helene Kulolia, Feb. 24. To Sam Kakelaka and Luisa Apo, a son, Feb. 20. 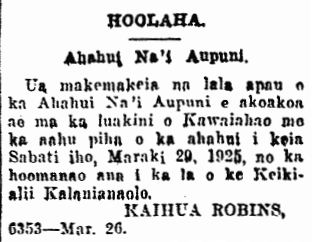 To Thomas Naehu and Lehua Kalani, a son, Feb. 20. To Henry Akau and Lokalia Puaalaa [? ], a son, Feb. 23. To Mr. and Mrs. Pascal, a daughter, Feb. 27. To Sam Kalili and Lokalia Perry, a son, Feb. 28. Miss Rebecca Koo, on Ilaniwai Street, Feb. 16. Keola Naeole, at Kalihi Hospital, Feb. 19. Ahea Kalani, at Leahi Home, Feb. 19. Bernice pa, on Luso Street, Feb. 19. Imiola, on Kukui Street, Feb. 22. Malie Gehan, on Insane Asylum Street, Feb. 22. Solomon Hinai, on Kukui Street, Feb. 22. Louis Foster, on Beritania Street, Feb. 23. Charles Yim On, Jr. on Kauluwela Lane, Feb. 25. Kealoha Kepano, on Keawe Street, Feb. 25. Alex McCandless, at Queen’s Hospital, Feb. 25. George N. Shaw, on Ilaniwai Street, Feb. 28. Ka Nupepa Kuokoa, Buke XLVIII, Helu 9, Aoao 8. Maraki 1, 1912. This is a leap year [makahiki lele oi], in other words, there are 29 days in this month, and there will be no more leap years until the year 1904, a span of eight years. When reaching 1904, there will not be another for another 200 years. There are these types of irregular leaps, as was explained above, every 200 years. This occurrence which is happening this year, took place 200 years ago, that being in the year 1696 and then in 1704 the leaping began again. Amongst the haole, this is the time for women and young men to pull in their hooks, that is if there is good bait on it. And what of our youth, will they be haphazard? Ka Makaainana, Buke V, Helu 8, Aoao 7. Feberuari 24, 1896. 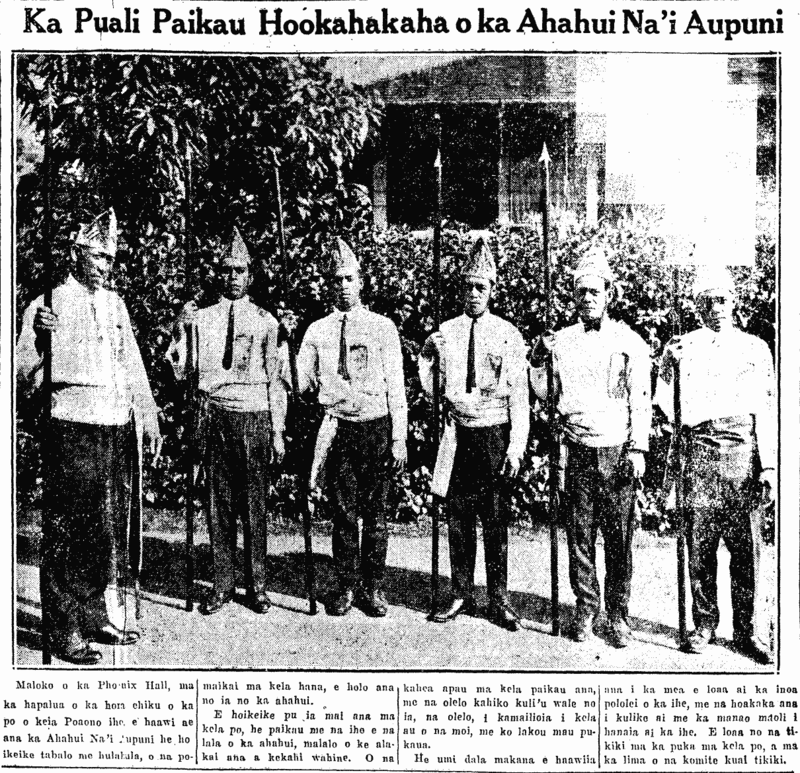 More Ahahui Na’i Aupuni, 1925. All members of the Na’i Aupuni Association are requested to gather at Kawaiahao Church in full uniform of the association on this Sunday, March 29, 1925, to celebrate Kuhio Day. Ka Nupepa Kuokoa, Buke LXIV, Helu 13, Aoao 2. Maraki 26, 1925. More about the Na’i Aupuni Association, 1925. Marching Drill Unit of the Ahahui Na’i Aupuni. In Phoenix Hall, at half past seven on this Saturday night, the Na’i Aupuni Association will hold a play and dance, and the profits from this endeavor will go to the association. Also shown on that night will be marching with ihe [spears] by the members of the association under the direction of a woman. The drill commands will all be in the old language—the language spoken during the monarchy, by their war leaders. A prize of ten dollars will be awarded to the one who knows the correct name of the spear, along with the explanation of the true circumstances under which the spear was made. Tickets are available at the door on that night, or directly from the members of the ticket selling committee. Ka Nupepa Kuokoa, Buke LXIV, Helu 17, Aoao 2. Aperila 23, 1925. 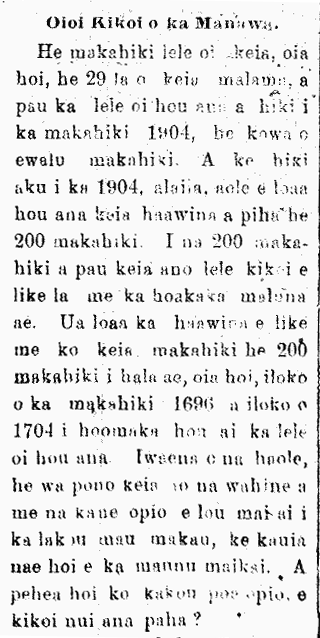 More on Ahahui Na’i Aupuni, 1925. 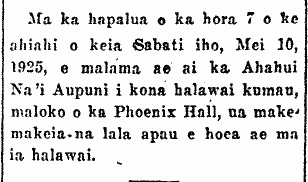 At half past 7 on the eveing of this Sunday, May 10th, 1925, the Na’i Aupuni Association will hold their regular meeting at Phoenix Hall; it is requested that all members attend this meeting. Ka Nupepa Kuokoa, Buke LXIV, Helu 19, Aoao 6. Mei 7, 1925.